The Wenatchee Foothills are full of wildflowers as this scene captured last week by Molly Cooper Steere attests. 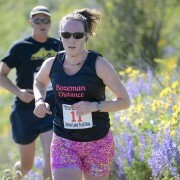 RunWenatchee is adding a new twist to this Saturday’s Horse Lake Trail Runs — a new half-marathon course that will have runners doing a complete loop of the Horse Lake Reserve for the first time. The new route incorporates the upper stretches of the Apricot Crisp Trail, which means half-marathoners will no longer have to double back on their original route. 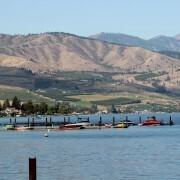 Both the half-marathon trail run and the 5-mile trail run begin at 9 a.m. Saturday at the Wenatchee Foothills reserve, owned and managed by the Chelan-Douglas Land Trust. The third-annual event, which is part of RunWenatchee’s Volyn Law Wenatchee Valley Trail Run Series, serves as a fundraiser for the Land Trust, with proceeds going directly to new trails in the Foothills. 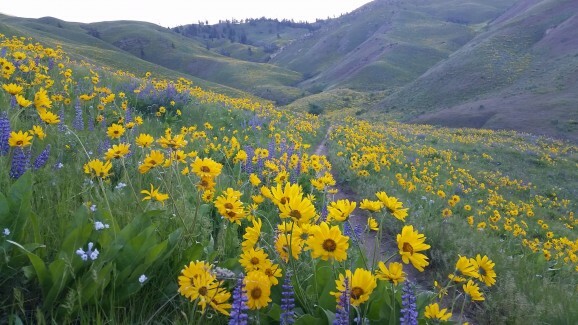 Last year’s event, for instance, raised money to construct the new Balsamroot Trail, just south of Horse Lake Road. Packet pickup and late registration will be held from 5 to 7 p.m. this Friday at Pybus Public Market, and from 8 to 8:45 a.m. Saturday at Horse Lake. On race day, the Mission Ridge Ski Team and Mission Ridge Ski & Board Resort will shuttle runners from the Wal-Mart parking lot to Horse Lake Reserve and back, beginning at 7:15 a.m. There is no cost for the shuttle. People also can drive to Horse Lake on their own, but parking is limited — only about 70 parking spaces in all. North Face, Great Harvest Bread Co., Caffe Mela, Greater Wenatchee Massage Association and RunWenatchee will have booths or tables at the trailhead, and there will be water, sport drink and food on the course and at the trailhead. The half-marathon and 5-mile courses will be well marked with directional arrows and volunteers posted at key spots. Top male and female runners in the half-marathon and 5-mile races will receive special awards. Division winners will receive a jar of “Horse Lake Preserves,” which come from an old orchard on the property. After the race on Saturday, runners can show their race bib number at Saddle Rock Pub and Brewery in downtown Wenatchee and receive 75 cents off a beverage, including multiple beverages. 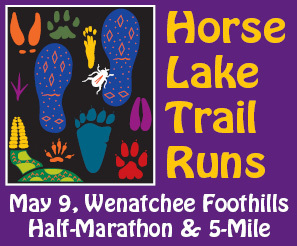 Horse Lake is followed in the Volyn Law Wenatchee Valley Trail Run Series by the Red Devil Challenge Trail Runs (25K, 10K and kids race) on May 31 near Cashmere, the Dark Side Festival Trail Run at Mission Ridge on Sept. 26, and the Oktoberfest Pumpkin Trail Runs at Leavenworth on Oct. 18. In addition to Volyn Law, other sponsors of the Horse Lake Trail Runs include Confluence Health, Krueger Chiropractic, KOHO Radio, Arlberg Sports, Mission Ridge Ski Team, Great Harvest Bread Co., Caffe Mela, Saddle Rock Pub & Brewery, Mission Ridge Ski & Board Resort, Orchard Bar, North Face, and Project Groundwork.